Beauty mixed freely and frequently with mechanical ingenuity at most stands during SIHH 2014, but there were undoubtedly several standout examples seen this week in Geneva that remind us what haute horology can achieve. As we noted in a previous post, Cartier supplied a host of artisanal models with flower petal dials and rich enamels. 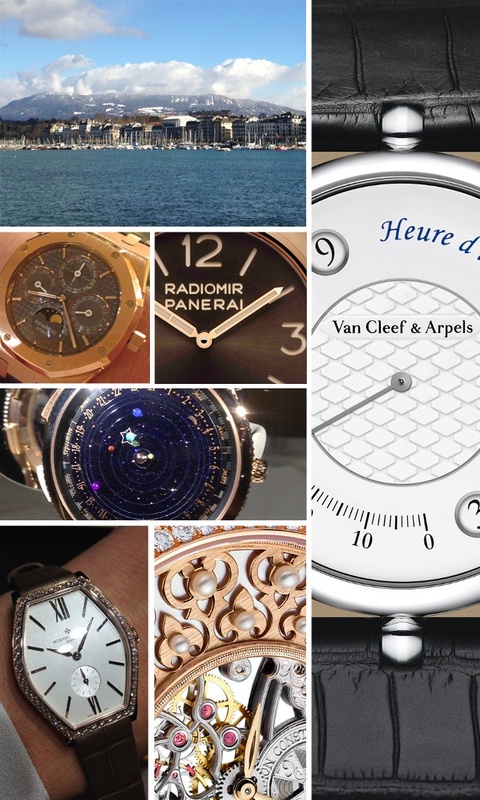 At both Van Cleef & Arpels and A. Lange & Söhne, visions of the universe graced dials and casebacks in models that were the subject of much discussion in Geneva. The back of the A. Lange & Söhne Perpetual Calendar Terranova, a watch depicted in mega-size in its SIHH stand, features an orbital moonphase and a fantasy depiction of the stars on its caseback. While there’s no artistic rendering of the sun, the watch’s balance plays that role perfectly. In a similar bit of casting, a Cartier tourbillon stands in for the sun on the Rotonde de Cartier Earth and Moon. By pressing the pusher at four o’clock on the side of the case, a panel descends and partially obscures the tourbillon carriage at the 6 o’clock position. The crescent thus formed reproduces exactly the moon’s shape in the sky at that moment. But perhaps the grandest celestial piece at this SIHH is the Van Cleef and Arpels Midnight Planétarium Poetic Complication, new to the company’s much-heralded Extraordinary Dials collection. The 44 mm timepiece depicts the movement of six planets around the sun and their position at any given time. Earth and Mercury, Venus, Mars, Jupiter and Saturn (the only planets visible from Earth with the naked eye) rotate across the dial at their real-life orbital speeds thanks to a complex movement by Dutch master Christiaan van der Klaauw. The wearer tells time via shooting star that orbits the dial once a day. He or she can also choose a lucky day during which the earth appears magically inside a star on the dial. At Vacheron Constantin, the Métiers d’Art Fabuleux Ornements collection assembles four ladies’ models that features openworking (a focus this year for this brand) and a combination of artistic crafts. Ten different master artisans create dials that depict scenes from Ottoman architecture, Chinese embroidery, Indian manuscripts and French lacework. Panerai adds another pocket watch, the PAM 447, a lovely limited edition of fifty pieces in either red gold or white gold that arrives with a matching gold chain and a stand. The Jaeger-LeCoultre Duometre a Quantieme Lunaire features a rich white grand feu enamel dial and stunningly proportioned hands, accents and moonphase. The Roger Dubuis Hommage series, especially the double tourbillon model with its deep-cut guilloche caliber plate treatment that doubles as the brilliant dial. Yet another piece that combines the technical mettle of Agenhor with the designers at Van Cleef & Arpels, the new platinum Heure d’ici & Heure d’ailleurs (time here and time elsewhere) double jumping hour model with minute retrograde. The titanium Montblanc Timewalker Chronograph 100 features two balances, one high frequency (360,000 bph) to indicate 1/100 of a second, and one standard frequency (18,000 bph) for the timekeeping. Three patents and a sporty look for Montblanc.